Gray eco-fleece crewneck sweatshirt with “Stapleton” print. Nice sweater made with soft fabric. Only problem is the sizing. I wear large shirts all the time but this is to small. Should of ordered ex-large. My wife loves it. Soft as a lamb. Just what the doctor ordered. Amazing quality sweatshirt, exactly what i expected. Definitely will be wearing all the time, love it! 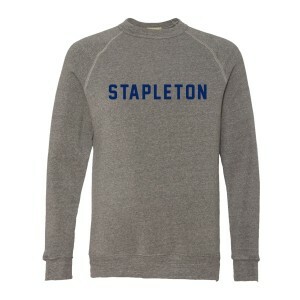 Ordered the STAPLETON sweatshirt, very happy with the quality and the fast shipment!